Our Christmas Wishes bouquet is a true festive delight with red roses, carnations, cinnamon sticks, pine cones, golden nests and feeling green blossoms. 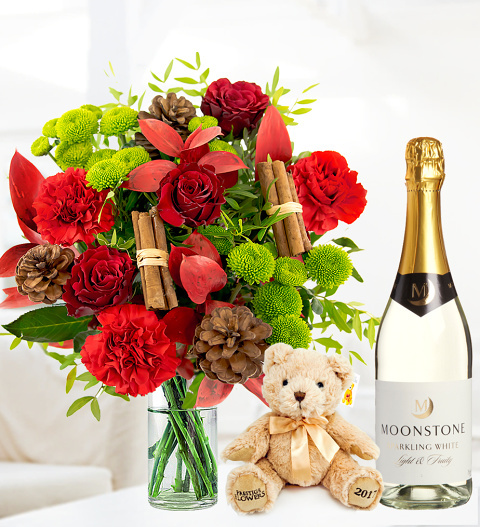 A brilliant bouquet that is perfect for all occasions and comes with a cuddly bear, a delicious bottle of Moonstone sparkling white wine 75cl and a FREE box of Belgian chocolates. Expertly arranged by our talented florists, the Christmas Wishes bouquet is available for UK next day delivery. Chocolates may contain nuts.